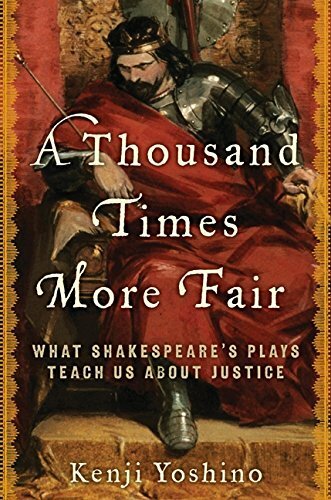 In the enlightening and readable A Thousand Times More Fair, author Kenji Yoshino opens a window on Shakespearean dramaturgy and scholarship and lets in a breath of fresh air. In the process, he accomplishes the seemingly impossible: a new and enlightening perspective. This examination is not just for scholars, though. Mr. Yoshino writes a rapidly paced, funny, and accessible elucidation of Shakespeare’s plays from a unique legal perspective that makes his book surprisingly astute as a study of literature and history, but equally valuable as an exposition of how Shakespeare’s plays illuminate many of today’s social and legal concerns. In fact, the book’s subtitle points to its stated mission. Mr. Yoshino actually wears two hats here. He is not only a serious student of English literature, with a concentration on Elizabethan poetry and playwright William Shakespeare, but also an accomplished attorney. Specifically, he is the Chief Justice Earl Warren Professor of Constitutional Law at New York University. It probably takes a lawyer to make the arguments set forth here, and Mr. Yoshino devotes each of the nine chapters in the book to the one play that he thinks best illustrates specific points of law. To illustrate the power, limitations, and consequences of revenge—that most human but destructive of emotions—he used Titus Andronicus. Mr. Yoshino also draws parallels between President Bush and Shakespeare’s Henry V, not to elevate the former President, but to reevaluate Henry’s right to invade France, no matter how impassioned the propaganda of his famous “Crispin’s Day” speech might be. In the cases of both France and Iraq, the justification was, he asserts, manufactured from nothing. Mr. Yoshino uses Othello to illustrate how “ocular proof,” the evidence of one’s own eyes, can trump the best of circumstantial proofs. To argue how the quest for “perfect justice” is more damaging than allowing for the imperfections of the system and achieving pragmatic justice, he uses Hamlet. In Othello, Shakespeare has his play turn on the handkerchief the protagonist gives as a love token to his wife Desdemona. When Iago, his ensign and the villain of the piece, steals the handkerchief and arranges for Othello to see it in the possession of his lieutenant’s mistress, this “ocular proof” becomes greater than any other evidence of her innocence, love, and devotion, enough so that he kills her for her infidelity. This power and limitation of ocular proofs is brought into the modern day with the murder trial of O. J. Simpson and the infamous ill-fitting glove. As the handkerchief is to Othello, Mr. Yoshino observes, so the glove is to the jury in the Simpson trial. What they saw, what could be measured, assumed overarching importance and resulted in acquittal. Throughout the book Mr. Yoshino draws similar comparisons and elucidates similar principles that are still operating today. In turning to Hamlet, he points out not only how the over intellectualization of principle can be detrimental to the outcome, but how an idealization of justice can be disastrous. Most people are familiar with the play’s basic plot: Prince Hamlet is distressed because his Uncle Claudius has killed his father, the late King of Denmark, and married the queen, Hamlet’s mother. He also assumed the throne of Denmark, a job that by all rights should have been Hamlet’s. The ghost of the old dead king appears to the prince and, like any good dad, lays an obligation on the young man to “revenge my most foul and unnatural murder.” Well and good. Simple revenge play, right? Wrong. For some reason, or reasons, Hamlet just can’t get around to it. As a direct result, by the end of the play the stage is littered with seven corpses instead of only one. Much printer’s ink has been spilled over why Hamlet hesitates. Of course, Mr. Yoshino offers his own legal perspective. Mr. Yoshino points out, surprisingly, that there were strong legal reasons for both Claudius and Hamlet’s mother Gertrude to act as they did, aside from pure lust for power. The old king was, it is inferred, losing his grip on the kingdom. Enemies were pressing in on Denmark, and to save the land, the king had to be removed. Gertrude could only keep all property inherited from the king if she married within a month after her husband’s death and younger brother Claudius was right there. Worked out well that way. From a non-legal point of view, though, Mr. Yoshino reiterates what other critics have surmised, that Claudius and Gertrude seem to be the happiest couple in all of Shakespeare. Claudius says she is “conjunct to my life and soul.” He’s not quite the villain we have been accustomed to in treatments of the play. And as for Hamlet, well, sometimes the idealistic quest for perfection just doesn’t make for the best ruler. Claudius knew his man. In another delicious observation, Mr. Yoshino says that if the protagonists of Othello and Hamlet had been switched, there would have been no tragedies. Hamlet would have given Desdemona every chance to prove her innocence and Othello would have dispatched Claudius without delay, thus saving almost the entire cast of characters. Mr. Yoshino’s literary scholarship is impeccable. He is detailed and insightful and has opened the plays of Shakespeare to the general public in a way that few other writers in this author’s experience have. Whether exploring how Portia would have been disbarred today for her manipulation of the outcomes of the various trials she adjudicates, or Prospero’s unusual and noble relinquishing of power, he is spot on in his analyses of historical and literary context as well as his bringing the themes of Shakespeare into the present day in a concrete and plausible manner. It is an emotional and intellectual delight not only for scholars, directors, and actors, but also for anyone who loves Shakespeare and the theater.